There is no doubt that beautiful smartphone handsets are the rage nowadays, but are the manufacturers copying each other instead of innovating? 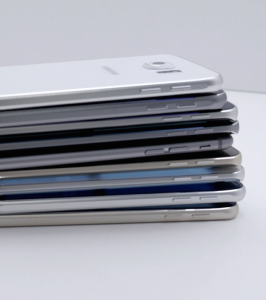 Yesterday, we suggested that Samsung had basically copied Apple in designing the Galaxy S6 and S6 Edge. Let’s take a look at the two devices side by side, and see where they are similar and what differentiates the two. Let’s take a look at the housing first. The Galaxy S6 has a metal frame, color-matched based on model, with Corning Gorilla Glass front and back. The iPhone 6, on the other hand, has the metal frame with glass on the front, but an all-metal back. Even so, in the stack of smartphones shown below, courtesy of 9to5mac.com, you can hardly tell which of the phones is the iPhone 6. Neither the Galaxy S6 or the iPhone 6 come with a removable battery, SD card expansion, or waterproofing. The screens on the two devices sport some differences. The Galaxy S6 has a 5.1-inch QHD Super AMOLED display with a resolution of 2,560 by 1,400 pixels. The iPhone 6, on the other hand, features a 4.7-inch IPS display, and its resolution is only 1,334 by 750 pixels. The S6 clearly has the better display, in comparison. Samsung also wins out in the front-facing camera, giving you a 5-megapixel front-facing camera to the iPhone 6’s 1.2-megapixel iSight camera. 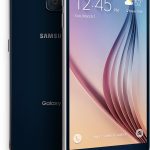 The Galaxy S6 also has a higher resolution rear-facing camera, giving you a 16-megapixels with optical image stabilization and an LED flash, along with a heart rate sensor. The iPhone 6, though, gives you a dual-tone LED flash to go along with its 8-megapixel camera. Some serious similarities show up in the button layout. Both devices feature the power or lock button on the right side of the phone, and the volume buttons on the left. The bottom of each device has the microphone, charging port, and speaker grill. You’ll also find the headphone jack on the bottom of each device, a design that has annoyed me since the iPhone 5. Inside the devices, of course, there are plenty of differences. The Galaxy S6 is powered by an Exynos octa-core processor with 3GB of RAM and your choice of 32, 64 or 128GB of storage. 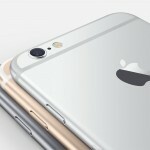 The iPhone 6, though, comes with a dual-core A8 processor at 1.4GHz and 1GB of RAM, with storage options ranging from 16GB to 128GB. 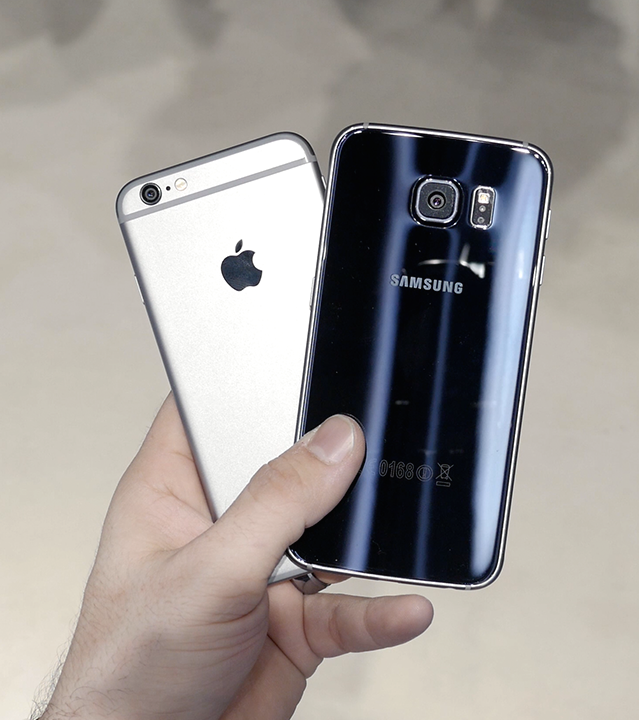 So, did Samsung directly copy Apple’s design for the Galaxy S6? Perhaps not entirely, but the cosmetic similarities between the two phones are truly too numerous to dismiss the possibility. For a more comprehensive comparison of the two phones in full HD, check out the video below, via 9to5mac.com. If you you can’t see the video below, please click here.